My only excuse is that I love quince. 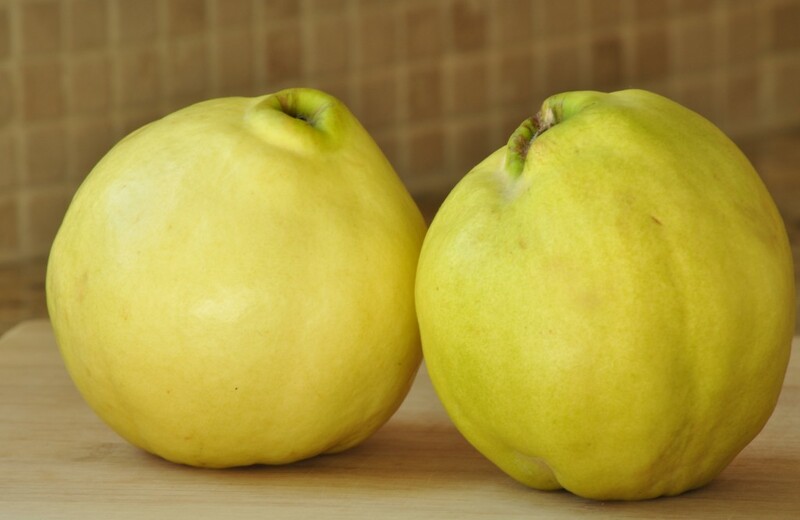 I will never understand why quince, with its luscious, honeyed flavor, is nearly impossible to find in North America. However, thus is the sad truth; and so, when I saw those few dozen quinces, I simply had to buy some to take home. But my misgivings regarding the origin of the fruit made me somewhat hesitant, and instead of buying a whole dozen, I went home with a mere two. What does one do with two quinces? Thanks to the severely limited quince resources on this blighted continent, my experience with them has been sparse. I’ve used them to make membrillo, and I know that poaching is a popular way to prepare them. Well, two quinces wouldn’t make very much membrillo, and there is no way to poach two quinces to serve as a dessert for five people. I began to wish that I had ignored my feeling of guilt and bought the entire stock of quince instead. But then I found a recipe for apple-quince pie on the Taste of Home website, one that called for exactly two quinces. And as I had not yet made a single apple pie this fall (horrifying, I know), it was obvious that this dish was the one that deserved my two quinces. 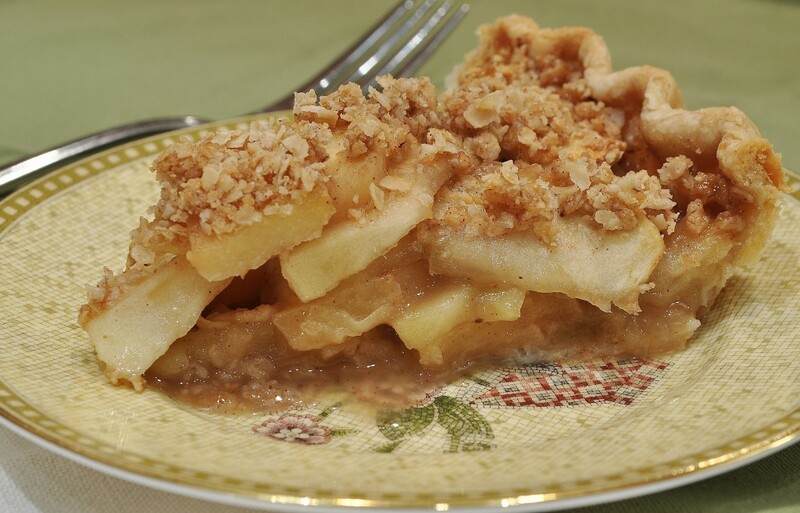 The filling for this pie is unique in that the quinces are first cooked on the stovetop and then put into the crust, while the apples are added in their raw state. The result is an intriguing juxtaposition of just-tender apples, still tart and bracing, and mellow, deeply fragrant quince—they almost taste candied after their long, two-stage baking. I didn’t fiddle with the recipe very much, although I did double the amount of crumble topping they called for, and still felt that it wouldn’t have hurt to have more. I added a pinch of ground cloves along with the rest of the spices instead of infusing the quinces with whole cloves, but that was only because I don’t usually keep whole cloves on hand. Nor do I always have cheesecloth. Probably you don’t either. So the ground cloves just seemed to be a better choice. 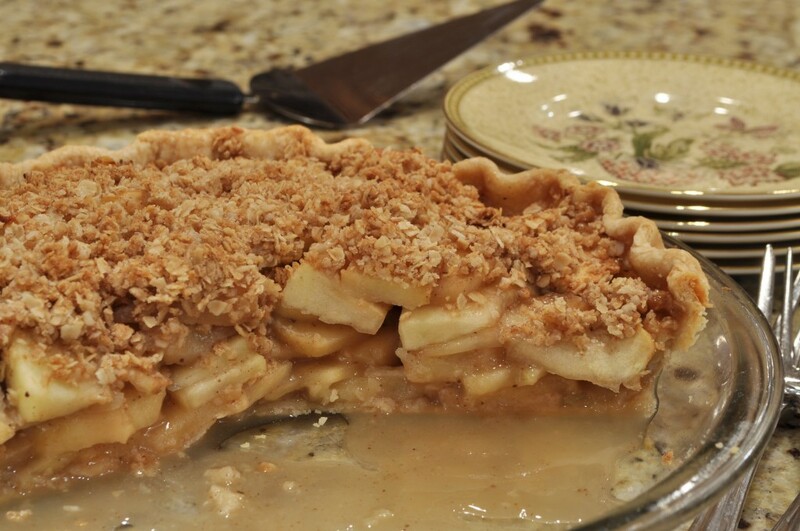 I also used brown sugar in my pie (the original recipe did not specify what kind of sugar to use, but I always use brown in my apple pies), and I found that the half-cup called for was not sufficient to curb the tartness of the Braeburn apples I was using. I would have preferred three-quarters of a cup, but if you are using apples that are less tart, perhaps half a cup would suffice. I’d suggest starting with the half-cup measure, and then tasting the mixture to see if you want to add more. So if you’re lucky enough to have quinces, you can liven up that ordinary apple pie for Thanksgiving this year—provided, of course, that you are of the apple-pie contingent, not the pumpkin or pecan ones. I, personally, have never aligned myself firmly with any group, as there are too many pies to make in this world to limit yourself to just one variety on Thanksgiving. Why, this year, I’m going to make one with caramel and cherries and . . . But you’ll have to wait until after I make it to hear the rest. Or at any rate, most of this recipe is adapted from Taste of Home. However, they didn’t include a recipe for the piecrust itself, just called for “pastry for single-crust pie (9 inches).” So I used the standard pastry recipe from my mother’s well-worn copy of Betty Crocker’s Cookbook. By the way, despite my advanced age of twenty-one, I only recently learned that Betty Crocker wasn’t a real person—I was so disappointed! 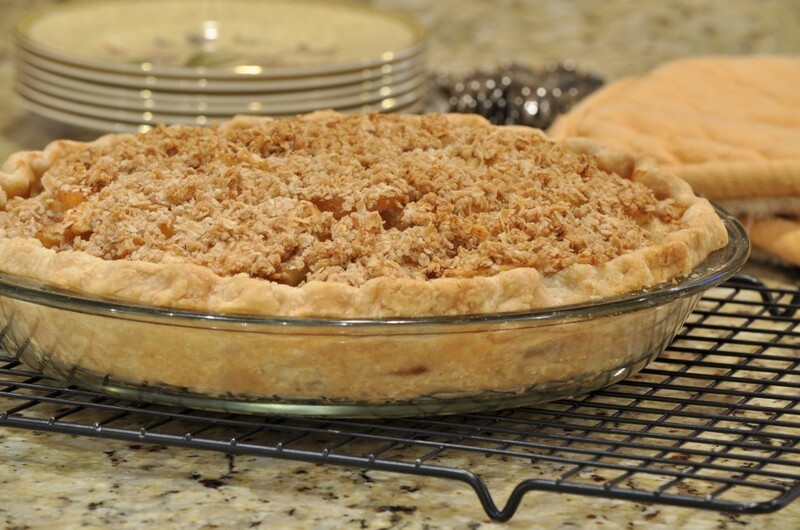 While the dough is chilling, you can cook the quinces and make the streusel topping. For the quinces, peel them, cut them in half, and core them. Slice thinly. You should get about 3 cups. Combine the sliced quinces and apple juice in a medium saucepan and bring to a boil. Reduce the heat, cover, and let simmer until tender. Since my quinces were fairly ripe to begin with, I found that 6 minutes was plenty of time. The original recipe, which must have been using rock-hard quinces, called for 12 to 15 minutes. So depending on the firmness of your quinces, you’ll want to start checking at 6 minutes, but be prepared to go up to 15 if necessary. Transfer the quince mixture to a bowl and let cool. In another bowl, make the streusel topping. 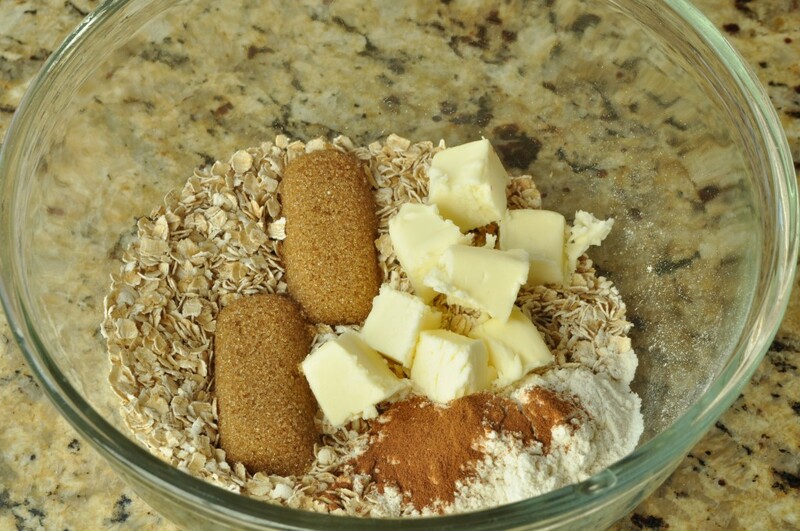 Toss together the oats, flour, brown sugar, and cinnamon; then rub in the butter until small clumps form. Set aside. 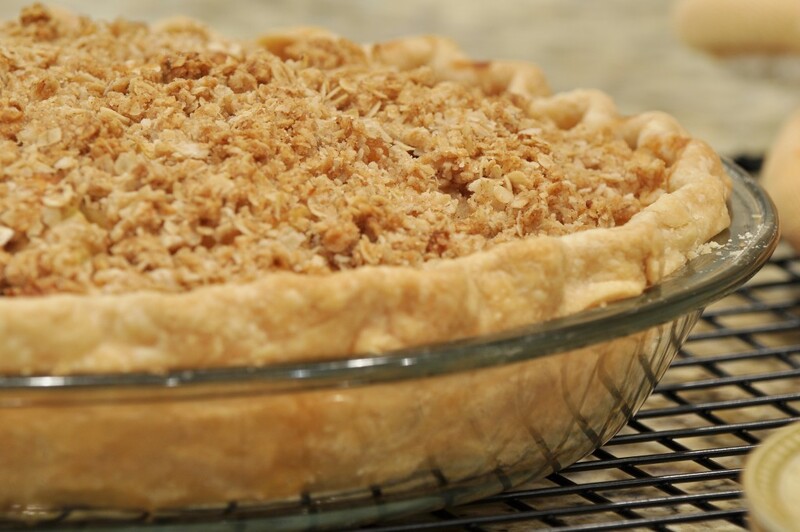 Once the pie dough is chilled, remove it from the refrigerator, unwrap it, and transfer to a flour-dusted counter. Roll out into a circle about 11 inches in diameter, rotating the dough after every few passes of the rolling pin and dusting the counter with additional flour as necessary. Now you can finish the filling. Peel, halve, core, and slice the apples. You should get about 5 cups. Place the sliced apples in a (very) large bowl. In a smaller bowl, whisk together the flour, spices, and brown sugar. Scatter this over the top of the apples and toss with your hands to coat evenly. Taste to see if you need to add more sugar. Gently stir in the cooled quince mixture. 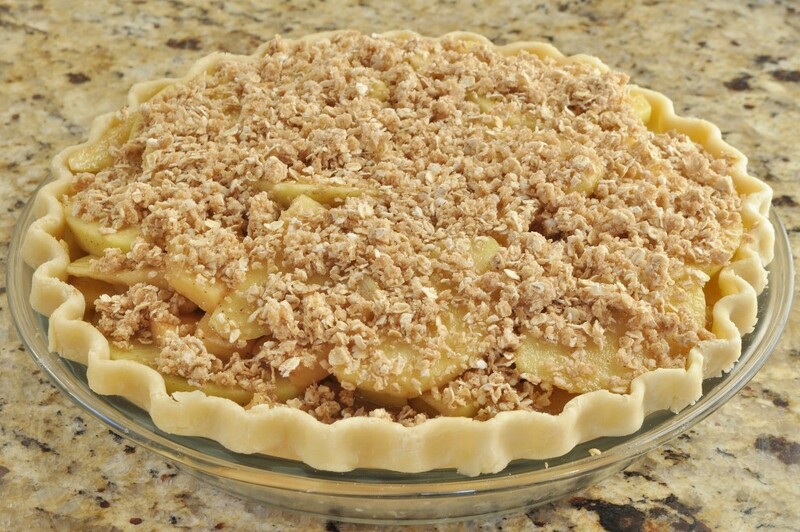 Remove the prepared piecrust from the refrigerator and pack the filling tightly inside. 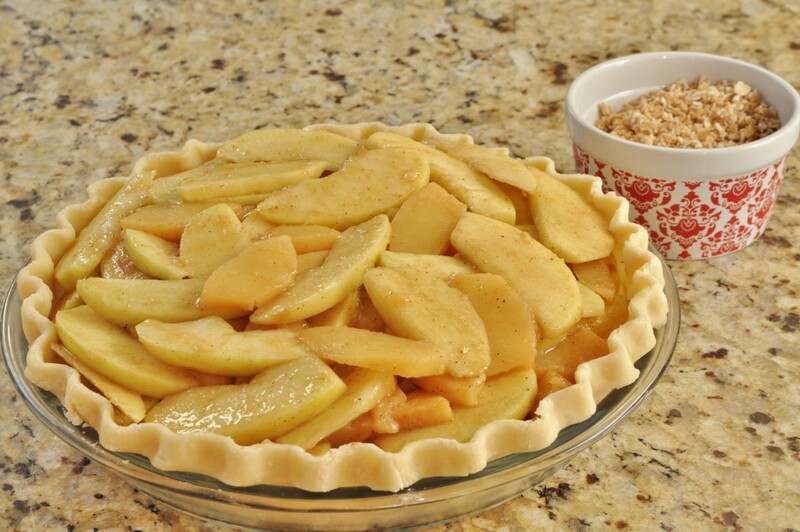 Sprinkle the streusel topping evenly over the fruit. 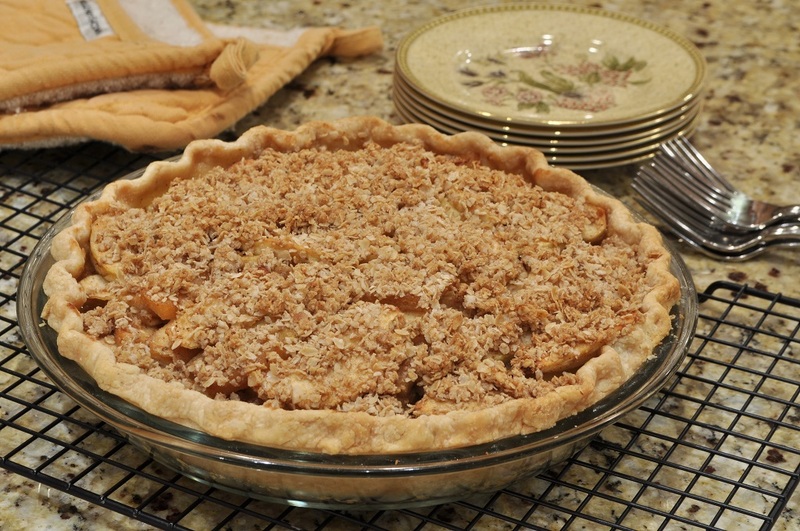 Bake for 55 to 60 minutes, or until the crust and streusel are golden, the filling is bubbling, and the apples are tender.